So… this whole sprinkles thing. It’s kind of getting annoying, right? Look at me! I’m obsessed with sprinkles! Wah wah wah. I need attention. Yeah. Not cool. I may as well just slap on some glitter eyeshadow and tease my hair. But in reality, I’m so obsessed with sprinkles because now that I’m in my mid-to-late (read: really late) 20s, it’s not so appropriate for me to be walking around sporting the newest shade of Urban Decay and blinding folks with glistening flecks from my lids. Um… what would you rather have? Me wearing loose sparkles on my eyes or a compulsion to bake you colorful vanilla cakes? So sprinkles it is. Everyone needs a vice. They are sort of like trashy gossip tabloids. Or the new, freakishly awkward version of 90210. Or chocolate covered bacon. Or skinny jeans. I really have no business dealing with any of the above but I die a little inside when I don’t get what I want. I’m okay with being a walking celeb stalker, wearing pants that make me look like a stuffed sausage and knowing the exact story line on every tween drama. And making homemade funfetti cupcakes. I’m okay with that too. 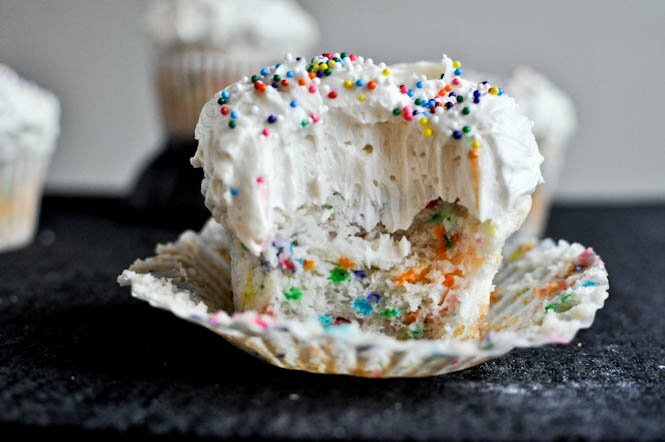 Funfetti cupcakes were always an obsession in our house growing up. Heck, they still are. Sometimes I still buy the boxed version. Yes I do. But I’ve also been making them from scratch for a loooooong time and really didn’t think you had any interest considering they are… hello… a vanilla cupcake with sprinkles. Simple. Yummy. Easy. Lovable. Don’t mind my crumbs. I’m messy. So if you feel like creaming some butter and scooping some flour, you’re in for a treat. My favorite part? Different sprinkles. Wowza. Sometimes I use the regular old things – you may refer to them as jmmies, but I just can’t get behind that. Other times I use the nonpareils, which I love because they have super bright, fun colors. If you haven’t noticed, I like bright colors. And sprinkles. And glitter. And bacon. Okay I’m done. Preheat oven to 350 degrees F. Cream butter and sugar in the bowl of an electric mixer until fluffy, about 3 minutes. Add eggs and vanilla and beat until combined. Combine dry ingredients in a bowl. Add half of the dry ingredients, mixing until just combined. Add the milk. Once mixed, add remaining dry ingredients. Fold in assorted sprinkles. Pour into cupcake tins and fill 2/3 of the way full. Bake for 18-20 minutes. Let cool, then frost. Cream butter in the bowl of an electric mixture until completely smooth and creamy. With the mixer on low speed, add in powdered sugar slowly. Gradually increase mixer speed and add vanilla, then beat for 2-3 minutes, scraping down sides and bottom of the bowl. If frosting is too thick, add milk 1 teaspoon at a time until desired consistency is reached If it’s too thin, add sugar gradually until it thickens. Frost cupcakes and top with sprinkles. I just love them ! It’s the second time i do the recipe, i don’t know why but my pastry is not white like yours (maybe cause of the yellow of the egg??) et the sprinkles just disappears once they are cooked… :( I’m so disappointed i’d like to do it for a bday coming in one week… Can you help me finding the solution please…? These cupcake photos have me straight up swooning! So beautiful. I wish I could just pull them straight out of my computer. Life is hard right now! Just made these and they are so yummy! I was afraid after reading the comments but mine turned out amazing. Batter is white and frosting is so good I can’t stop eating it! I hadn’t made these in years, but I always come back to this specific recipe. It’s the best I’ve tried, and it’s so easy. Tonight, I had some sour cherries on hand and whipped up a simple frosting with them pureed in, and the cupcakes went great with it. Of course, I added plenty of sprinkles. Where the heck is the salt? Why didn’t you tell me I needed room temperature butter? Just made these on my blog… they are so delicious! I swear there is no better cupcake than a Funfetti cupcake :) Thanks for the recipe! i didn’t have any butter available, so i used oil. the batter looked and tasted fine but when baked the cupcakes didn’t have the dome shape they were just flat and tasted a but off. but thats on the no butter aspect i guess. 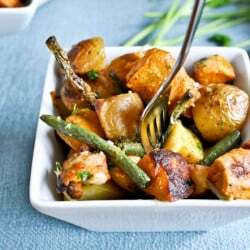 overall, great recipe!!! I’ve made many homemade cupcakes before. Unfortunately these are quite dense when made following the directions exactly. Also, the frosting tastes like butter…straight butter. Finally, the pictures are not of the cupcakes in this recipe, I knew it before I made them, but wonted to believe it would work out. Cupcakes cannot be white like those shown in the picture when whole eggs are used. I would suggest finding a different recipe, especially if you want white cupcakes. No offense but these sucked how come the pictures look so good. Mine turned out like a cookie on top of a cupcake.. it was so hard on top and it started to sink in it looked so bad. These came out very yellow and dense – more like a cookie than a cupcake. I would not recommend this recipe if you want pretty, fluffy cupcakes. Hi! Making these cupcakes for my daughter’s 4th birthday party next weekend! I made them for her 2nd bday too! Anyways – would you happen to know how many days in advance I could make the cupcake (sans frosting) or if they would hold up in the freezer okay for a few days? Thanks so much! Mine didn’t quite turn out as white as in the picture but they still looked and tasted fantastic!!! I was worried after reading some of the negative reviews of this recipe but I have to admit they were probably the best cupcakes i have ever made! I added 1/2 cup of milk instead of 1/3 like some suggestions mentioned and they were perfectly moist, not at all heavy.